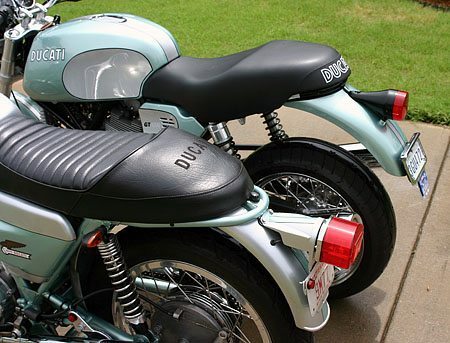 It was Fall of 2003 at the Tokyo Motor Show and Ducati announced its plans to introduce theSportClassic line of L-Twins. “Motorcycles that capture the essential beauty, timeless style and emotion of the original Ducati sport bikes of the 1970’s.” read the press release. 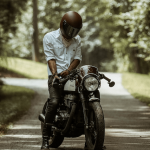 “Even though they reflect the best of the past, they incorporate the latest Ducati technology and engineering, creating a thoroughly modern motorcycle that lives up to today’s standards of road-going performance.” I was mentally knocked off my feet. At the time of the SportClassic announcement, I was deep in the process of “custovating” a 1974 Ducati 750 GT bevel head. What’s custovation, you ask? It’s a term I use to describe my work — a combination of customizing and renovation. We’re not talking about a restoration, which means to bring back to an original condition. Custovation has a more specific meaning: customize – to make or alter to individual or personal specifications, combined with renovation – which is to restore to an earlier condition, by repairing or remodeling. 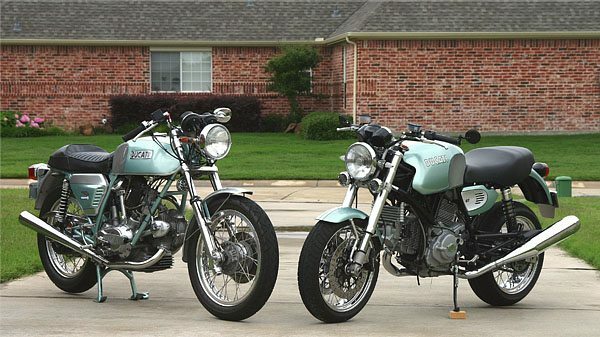 For example, the 750 GT shown here is a blend of the old and the modern, with the modern improvements including the ignition, an upgraded front brake and charging, but most noticeable is the retro 750 Super Sport green and silver paint scheme. Reading about the proposed SportClassic models did two things for me. First, it confirmed what I believed all along, that the fundamental design and appearance of the SS, Sport and GT had a permanent place in motorcycle design history, and I had my little sliver of that. 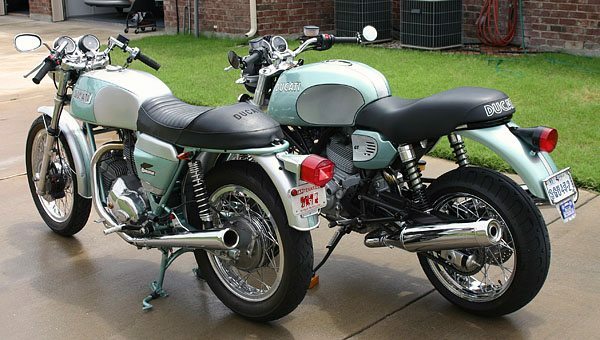 Second, it launched a personal odyssey that led me to owning a 2006 Ducati GT1000. In 2003, the SportClassic follow-up articles mentioned how the Paul Smart 1000 was inspired by the 750 Imola Racer; the Sport 1000 was designed in the café’ style and the GT1000 would be following in the footsteps of the classic 750 GT. 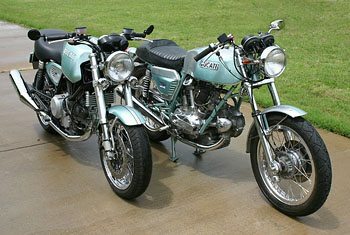 Ducati also went on about the limited production numbers for these bikes and how the cost would be out-of-sight for the average guy. That did it for me. Any fantasies about owning a modern mate to my classic 750 GT went up in mental smoke. Four years passed and the 750 GT and I enjoyed leisurely outings, with compliments from everyone that took the time to look. Then a funny thing happened one Saturday afternoon. I happened by the local BMW dealer and there — sitting by the shop door — was a Ducati Red GT1000, two months old, with 350 miles on the clock and a soft asking price. But I didn’t see the red color; instead I saw green and silver, with a trimmed tail light, bar-end mirrors and muted turn signals. I imagined a custovation, with the GT1000 looking similar to but not exactly like my 750 GT, since the GT1000 is made in the image of the 750 GT but some 33 years later. On the other hand, I wanted to show the strong connection that confirmed they are from the same gene pool. The tail light modifications were first. The turn signal stalks were removed, holes filled with ABS epoxy and repainted. Amber LED signals replaced the front signals and the rear units were installed under the seat to make them less conspicuous when off. The GT1000 uses an electronic control circuit located in the instrument cluster to manage the blinking, so there was no problem with erratic blinking usually experienced by thermal activated switches. 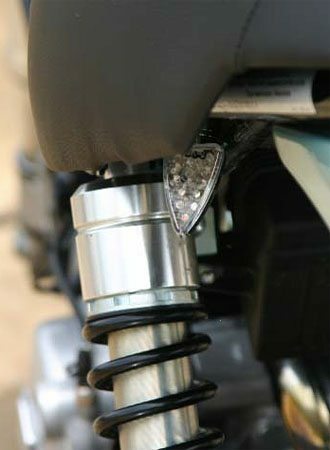 The reflectors and license light were removed from the stock assembly and excess plastic trimmed. 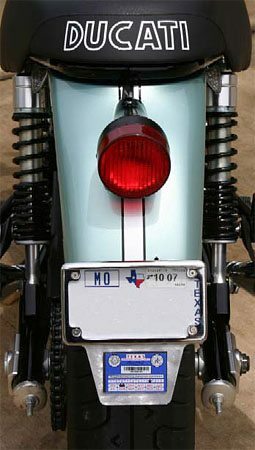 The new license light is a die-cast chrome frame with integral white LED’s from Custom Dynamics. At night, the white glow is a real eye-catcher. 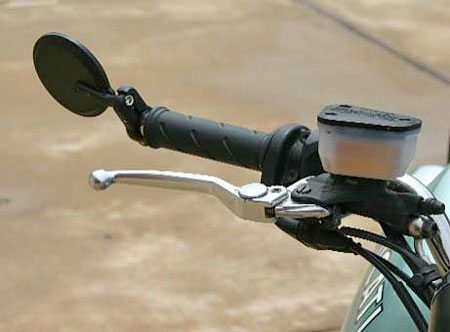 The mirrors are 3 inch machined aluminum with a slight fish-eye design, exactly like CRG Hindsight mirrors but one-third the price from Cycle Gear. I have a pair of Hindsight’s on my Centauro, and they look identical. I usually do my own painting but I went back to the expert who had painted the 750 GT. Ed Terrell does excellent work but re-assured me that cars are where he makes his money. 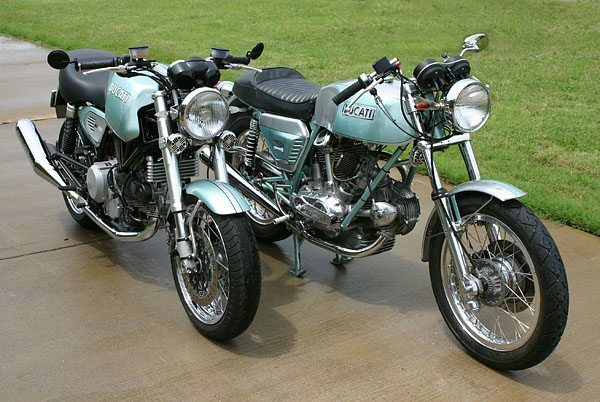 The stock sound of the GT1000 is subdued compared to the 750 GT’s Conti replicas. After 3 months of tracking down local GT1000 owners with Termignoni’s and Staintune reverse megaphones, my ears told me it was Staintune (Editor’s Note: See our GT1000 Blog for more info on the Staintunes). The silencers have a hefty low rumble at idle with a bit of a British twitter. On acceleration, they sound off with authority. It’s a different sound than Termi’s, more like a Norton Commando on steroids, but a sound I prefer for the money. And maybe a Snider’s removable clear plastic Paintgard will cover the critical chafe areas where the rear of the tank meets the seat front. My paunch doesn’t help matters either.